Large one bedroom apartment featuring a King size bed or Queen size bed with a kitchen, living room and balcony. All guests enjoy free Wi-Fi, free Foxtel and secure undercover parking. 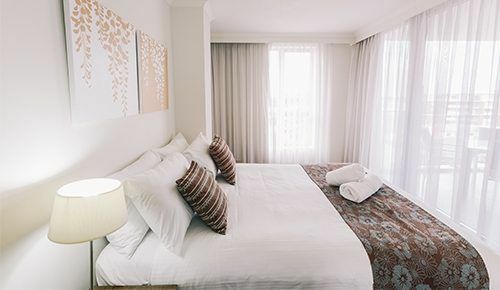 Luxury two bedroom apartment with a queen size bed and the option of a king size bed or two king singles. The apartment features two bathrooms, fully-equipped kitchen, living room and entertainer balcony. Enjoy the many amenities of the hotel including outdoor pool and gym. 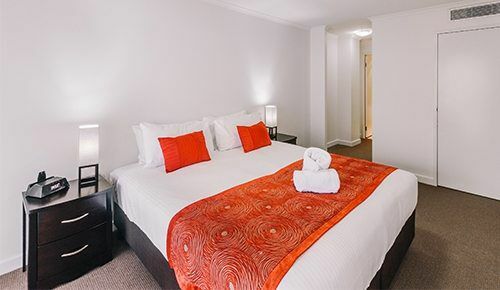 All guests enjoy free Wi-Fi, free Foxtel and secure undercover parking. Spacious three bedroom apartment with 2 queen size beds and a king sized bed or 2 king singles. The apartment features two bathrooms, fully-equipped kitchen, living room and entertainer balcony. Enjoy the many amenities of the hotel including outdoor pool and gym. 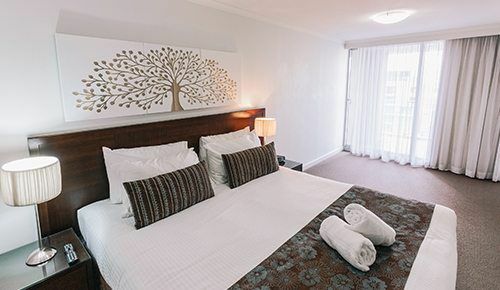 All guests enjoy free Wi-Fi, free Foxtel and secure undercover parking.